He was the odd man out of his art generation. Now we can all appreciate the fierce genius of Honoré Daumier at the RA. Artists who don’t fit in — the Goyas, the Hogarths, the Messerschmidts — are such an interesting bunch. It’s as if their genetic make-up is different from that of the other artists of their time. They’re like fish who swim upstream when all the other fish swim downstream. Is something missing? Has something been added? Why is it that their way is so implacably different from everyone else’s way? One day we’ll know: an Oxbridge mathematician will calculate their difference with an algorithm. But until that unhappy day arrives, we can continue to bask in the delightful artistic mystery of it all. And puzzle ourselves to sleep wondering how it was that Honoré Daumier, the great French square peg now being examined by the Royal Academy, ended up as uninsertable as he was. His dates, 1808-79, place him in between things. Younger than Ingres or Delacroix, older than Courbet and Manet, he was too early for the impressionist revolution and too late for the return to order. But because he was French — born in Marseilles, slap in the middle of the Napoleonic age — he had that unshakable arrogance that allowed him to assume the rest of the world was wrong, and he was right. Everything about him was different. His bold, black, wild and sloppy brush strokes are a good 50 years ahead of their time: how can someone born in 1808 have painted so adventurously? His fierce and accusatory mind-set separated him from polite opinion as comprehensively as a Berlin Wall: whatever the bourgeois was for, Daumier was against. 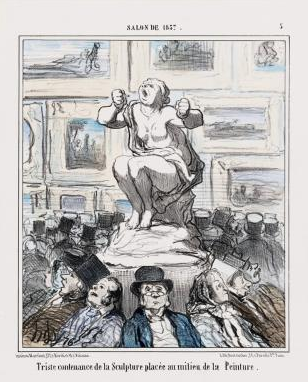 And his instinctive empathy with the lower classes made him visibly allergic to the posh Salon culture in which he was forced to operate — heavens, but we could do with someone like him on the scene today, challenging the Tate empire that calls our shots as energetically as Daumier challenged the Salon system that called his. To prove all this, the RA has gathered up a surprisingly comprehensive quantity of his output — surprising because he was so prolific — and squeezed it into those unhappy upstairs galleries at Burlington House that endow everything you put into them with the atmosphere of a footnote. That, alas, is Daumier’s fate: never to take centre stage. The last big Daumier exhibition in Britain was held at the Tate as long ago as 1961, so not even I can remember it. With so much catching up to do, the academy has crammed an impressive number of paintings, drawings, sculptures, lithographs, even a few photos, into a journey that is perhaps a tad too busy to allow a distinctive outline to emerge. Not, of course, that Daumier had a distinctive outline. In his own lifetime, he was better known for his cartoons than for his paintings. Allergic to kings, emperors, lawyers, government ministers, army chiefs, newspaper tycoons, fashionable artists, bankers, businessmen and art collectors, he kept himself exceptionally active expressing his contempt for all of them in newspaper lithographs so beautifully drawn that someone gave him the title “the Michelangelo of caricature”. The show includes a large selection of these fine artistic attacks, beginning with the one that savaged the new king, Louis Philippe, in 1831, earning Daumier a prison sentence of six months from the French censor. Called Gargantua, the guilty image shows Louis as a giant bourgeois sitting porkily in an armchair, ingesting money from the poor through his mouth while excreting government ministers from his arse. Why would they send him to prison for that? Gargantua is one of the most cartoonish of Daumier’s cartoons, yet even here his serious skills as a draughtsman are made unmissable in the tiny thumbnails of the Parisian wretches forced to feed the giant king with money. Born into a slab of French history that was constantly being dug up and changed, like endless Parisian roadworks, Daumier needed to remain especially nimble. Perhaps that’s why his art is so agitated and varied and stylistically unsettled. And why its scale tends to be small and grenade-like. In England, the pre-Raphaelites, who were born 20 years after him, and whose escapist nonsenses are such a betrayal of their own era, had all the time in the world to dream their silly medieval dreams. Daumier, born into the violent vortex of change that was 19th-century French history, never had a second to avoid modernity. Personally, I would have enjoyed more information about the identities and crimes of the beautifully drawn victims who crowd into his political lithographs. But with so much to get through, the display can only afford to be cursory. In any case, it is this show’s stated ambition to deal more fully with Daumier’s paintings than has happened previously in Britain. And the paintings have a completely different tonality to the cartoons, caricatures and Spitting Image puppets that constitute his sculptural oeuvre — and that make a brief and somewhat tokenistic appearance here. While the caricatures and newspaper attacks are merely brilliant, Daumier’s paintings are different to the point of being otherworldly. It’s hard to think of another painter whose work seems as self-evidently progressive and out of step with his times as this. Goya, perhaps. Rembrandt, perhaps. 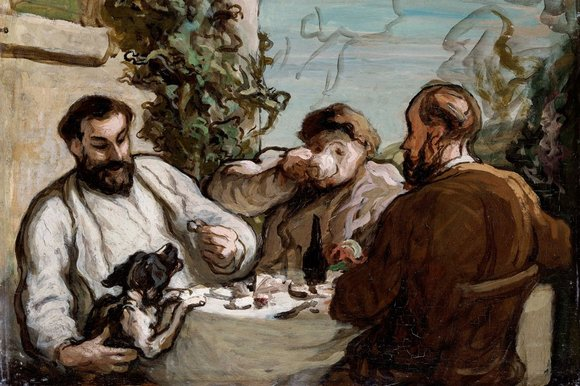 Daumier is not quite in either of their leagues — too much of his energy went into churning out everything else on show here — but as a painter he shared their stylistic fearlessness, and their darkness. From start to finish, his paintings attempt unusual things. A favourite strategy is to paint what the French call “contre-jour” —against the light. Imagine a silhouette of someone standing against a shop window: with most of the light coming from behind, the figure itself is bathed in darkness. It’s an effect used often by Rembrandt, and a deep test of a painter’s skill, because sunny colours are easier to repeat than gloomy ones. Daumier kept attempting the strategy, most notably in his famous image of a Parisian washerwoman carrying her laundry up the banks of the Seine while holding a small child by the hand. Without contre-jour, this would be a warm piece of social observation. With contre-jour, it enlarges into an image that is almost biblical in its heft. The bold, simple outline of the washerwoman leading her child from light into dark seems somehow to enlarge into an image that spells out humanity’s lot. Daumier’s Rembrandtian mood is made utterly explicit in the unexpected Christ who looms up suddenly in a large painting from about 1850, called Ecce Homo. He’s unexpected because previously in the show — in the spiky cartoons — Daumier had so obviously relished taking a pop at the church and its ministers. But in this dark, strange, scratchy Ecce Homo, the backlit Christ whom the crowd is mocking and the contre-jour is singling out (he’s little more than a black outline) takes on the larger and more secular identity of every unfair victim who has ever had a finger pointed at them. It’s brilliant stuff. Daumier the painter is such an inventive user of darkness and empty spaces; of simple outlines and profound gestures. The clever details that are such an enjoyable aspect of his cartoon work give way, in the paintings, to a great simplicity. It’s as if everything unnecessary has been removed — unnecessary colour, unnecessary figures, unnecessary complication — leaving only the pictorial essence of what this weird and brilliant artistic presence is seeking to lament.